Happy 2nd Birthday To Mahzuz! I was so surprised when I got into the house. I saw 4 new faces! in the cage. They are gorgeous and make me feel jealous >:I I wonder where they came from so I went to ask umie to get more information about them. 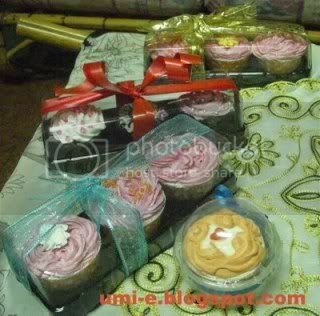 Umie told me that they were given by their owner (auntie Sue) because her daughter is asthmatic and allergic to cats. Therefore, reluctantly auntie Sue had to give them up for adoption. However she wanted to give the cats to someone that could look after and love them truly. Umie was introduced to auntie Sue and they made an arrangement to drop the cats to our home. They are very fluffy and much more bigger than me :/ Kakak doesn't want them to be cooped up in the cage, so Kakak put them in Kakak's room so that they can roam freely... At first umie thought that they could stay in Xing Yun's room but as usual Xing Yun will never welcome any other cats. So we'd better not take any risks. Even though the cats are next to Xing Yun's room but Xing Yun doesn't know about them because Xing Yun doesn't comes out. We are not allowed to enter Kakak's room and I am not happy with it. Anyway, later I could understand why umie and Kakak don't let us go in to the room. 500 gm steamed fish meat. 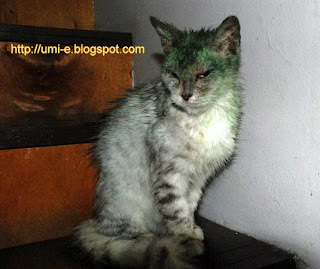 As some of you might know, we are all still very sad with Envy's death :(( Of course we could not easily forget her, especially umie... after only 6 days after Envy went to the rainbow bridge, a female cat suddenly appeared at our back door. We've never seen her before, we don't know where she came from... the first time we looked at her, we felt sorry to her... she really needed help but it was very unlucky that none of the nearby vet clinic was open due to the Chinese new year break and long weekends. After 3 days she was given the injection and applied some medication cream on her face and body, she is now getting better. Yesterday Kakak washed her because she was a bit smelly :/ and she even stayed the whole night in the bed room. Umie just let her roam freely in the house to let her feel that she is now safe. 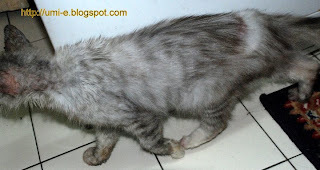 Hope she will get better and get back her prettiness :p Umie also found a nice name for her --> Khayla (it means PRETTY). * Auni still continues having her cold and Alif got scratched on his left eye but he was given the eye drop and we hope he will get better. Concussion 1000 Blogs!!! By Ben Ashari - GEGAR 1,000!!. BLOG OLEH BEN ASHAARI. Today, this entry is about Ben Ashari, a Malaysian blogger who is trying to gather 1000 blogs/bloggers. Actually umie has no idea how it is, however umie still wanted to support his project :) therefore umie put up this entry. This is a project to gather 1000 blogs/bloggers by Ben Ashari. This year the Lunar New Year falls on February 3rd and it is the most important festival of the traditional Chinese. The Chinese New Year consist of a period of celeRabbition, starting on new year's day. It means that the new year will be celeRabbited on the fisrt day of the month of the Chinese calender. the Rabbit is the fourth of the 12 Chinese zodiac (Rat, Ox, tiger, rabbit, dragon, snake, horse, goat, monkey, rooster, dog and pig). Ancient Chinese believed there was a rabbit living on the moon. Rabbits, especially ones with white fur, are also a symbol of longevity in traditional Chinese culture. The ancient Chinese believed it was the incarnation of Alioth, the brightest stars of the Triones. It was said that people born in the year of the rabbit are the luckiest among 'the 12 animals'. The rabbit is a symbol for mercy, elegance, amiability and worship of beauty. People born in this year are kind, speak gently, peaceful, quiet and loving person.